Have you ever come to a hackathon thinking, “oh crap! I don’t have anyone to do a project with?” Have you joined the disorganized mess of people all rushing to get a team? HackWithMe simplifies the hackathon team finding process, bringing hackers with related interests and expertise together; all hackers need to do is write a few topics of interest on a website. HackWithMe takes the interests of teamless hackers, and sorts them into appropriate interest groups using semantic relationships scraped from stackexchange. 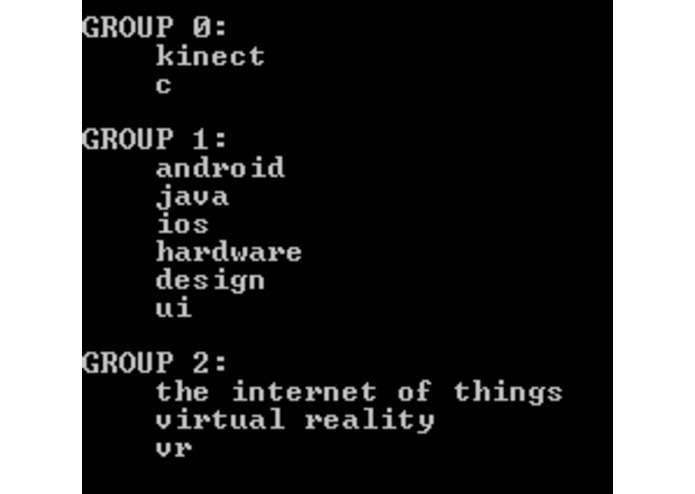 Hackathon organizers specify the number of groups and where they will meet, and HackWithMe decides which interests belong with which groups, displaying this information on its website. I worked on the back-end of the program, with Robert, working on making the Python work, I hadn't done much with python previously, so it was fun to go deeper into the language. I am the UX/UI Designer who worked eagerly on the Front-End Development. I built our website with HTML, CSS and attempted to build our data banks using PHP. Leading up to it, I helped lead ideation, initial wireframing, and producing mockups using Photoshop. Myself and Guile worked on the algorithms and heuristics involved in combining a set of hacker interests (in plain text) into appropriate interest groups, making use of python and the stack exchange API in particular.